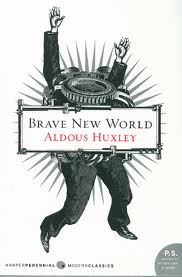 What is the overall message of Brave New World? shown me true happiness and the rewards of struggle. What does John mean by saying nothing in civilization costs enough? He is saying there is no struggle and no steps to take to achieve happiness. anything, you feel no achievement or happiness after a great accomplishment. think is focused on truth and beauty? problems in the world. They want the truth and they want beauty. since the last seminar because last seminar I was much shyer and I spoke less. in and it helped me realize exactly what I think is right and is messed up. happiness. Also this book has given me a stronger perspective. I think at first Danny feels like he is supposed to be ashamed of his race and that he has to sort of hide him self then making him timid. Then later in that book he starts to be more confident in his self and who he is. For Uno I think he feels like he has to be like the man box in some ways like he has to be tuff and top dog. Then later on I think he still feels that way but he pretty much just gets more comfortable with Danny. I think the further in the book the more comfortable they get with each other making them slowly take there masks off and being who they truly are. They take us to this kid that is half white and Mexican and they share all his problems that he has with race mainly. They tell how he has been socialized which is to think he is an outcast because of his color. He believes he is a target and so he acts like one and feels like one although he just wants to have a social group. Then later on he meets this kid Uno. Uno was mainly socialized to be like the man box. Which is to be top dog, don't cry, and be tuff. Then at the end of the book they start realizing who they really are. What I mainly got from this book is that some colored people can be ashamed of their color and that sometimes their color can change what they do or like to do. Like Danny was ashamed at first. Also when Danny was afraid to play baseball. I don't think anyone should be ashamed about any aspect or feature about them. Also they shouldn't let there color determine who they are.